"What she has taught me, there's no way to ever repay it." Dan Stewart met self-advocacy leader Betty Williams in 1997, when he was applying for the position of executive director of the agency now known as Achieva Resources, a disability service agency in Richmond, Indiana. Betty grew up in Richmond, had been employed with Achieva's sheltered workshop, and was on the search committee. Dan was hired. He says that during the period Indiana was closing its institutions for people with intellectual disabilities and transitioning them into the community, "I was able to work with Betty side by side." (Muscatatuck and Fort Wayne Developmental Centers closed in 2005 and 2007.) "She had a profound effect on seeing those [transitional] programs grow and develop." "The training that she did in this state over the last ten years is just, it's truly amazing." Betty became nationally known for her self-advocacy work and died in December 2018. 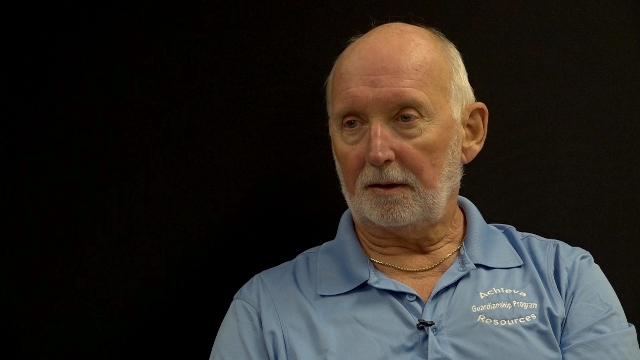 Dan was retired director of Achieva Resources when he was interviewed in 2018, two months before her death. "Dan Stewart - A Lasting Impact on Advocacy Across the Nation " YouTube video, 00:02:45, interview excerpt 134-mi-01 by the Indiana Disability History Project, posted by "Indiana Disability History" on December 5, 2018, https://youtu.be/cigwR7eJaZc.